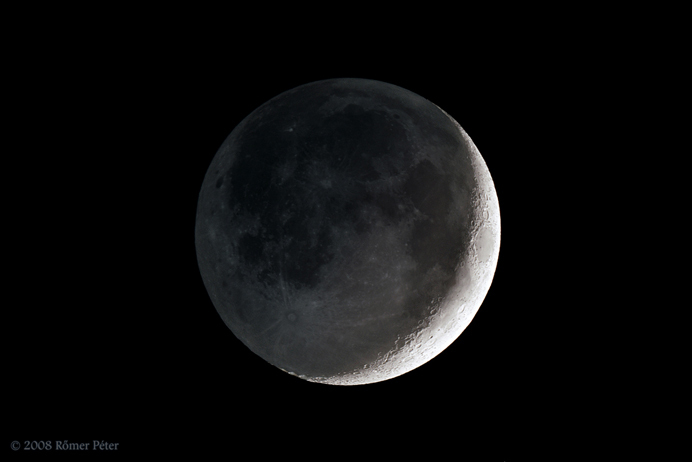 This is a high dynamic montage (HDR) of the crescent Moon, on which the bright daylight areas can be observed with the much dimmer Earthshine at the same time. The montage is made of five different exposures. The curiousity of this photograph is the large dynamic range. The thin crescent of the Moon is illuminated by the Sun, directly. The other part of the lunar disc gets a very dim, reflected light. The difference is too large to make a serviceable mask for composing the elements. The two main elements of the composit. The long exposed element was taken on 9 th February. That night 7% of the Lunar disc was illuminated by the Sun. The other, short exposed element was taken a day later, on 10th February at 14% phase. In 24 hours the terminator moved a bit toward the night side that made me possible to hide the luminance differences. The required mask to compose the different elements was also taken on the second night. For the polar regions I used the images of the first night.